The following is a list of accredited colleges and universities in the U.S. state of Florida. Many of these schools have multiple campuses, and therefore only the location of the main campus in Florida is specified. Most public institutions and traditional private institutions in Florida are accredited by the Southern Association of Colleges and Schools; religious schools are accredited by the Association of Advanced Rabbinical and Talmudic Schools (AARTS), the Association of Theological Schools in the United States and Canada (ATS), the Association for Biblical Higher Education (ABHE), and the Transnational Association of Christian Colleges and Schools (TRACS). The State University System of Florida comprises twelve member universities. 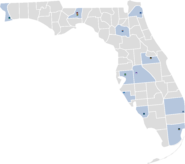 The Florida College System comprises twenty-eight community colleges and state colleges. College of Business and Technology (Miami) a.k.a. "CBT College"
Prior to 1968, racially integrated education was prohibited by the Florida Constitution of 1885. In an effort to show that the state of Florida had a separate but equal college system for blacks, counties, with state support, established 11 junior colleges for blacks; only one already existed (Booker T. Washington). In several cases a new junior college for whites was founded at approximately the same time. The 11 new junior colleges were opened in the late 1950s and early 1960s. They were abruptly closed following passage of the Civil Rights Act of 1964. ^ "Welcome to Atlantis University".